Air pollution surrounds us daily… car exhaust, smog, indoor air. Indoor air? Yes, indoor air quality is important to your health. Your exposure to air pollutants can be up to 100 times higher indoors than outdoors. The American Lung Association estimates that most people spend 90 percent of their time indoors. So clean indoor air is very important. During the summer months when you’re stuck inside because it’s too hot outdoors, you’ll appreciate having clean, cool air in your home. If you’re already going to be indoors, spend some time to make sure you’re more comfortable. There are a few upgrades, additions and chores you can do to improve the quality of your indoor air. Boswell Plumbing, Heating and Air Conditioning can help improve the quality of the air you are breathing. Indoor Air Quality (IAQ) is a measure of indoor pollutants. Which in turn can indicate the possible ill health effects and comfort of a home's occupants. Many everyday unsuspected household items contribute to poor indoor air quality. Compounds found in carpeting, furniture, upholstery and drapery fabric constantly emit gas or fumes. Other sources of pollutants can include, but are not limited to, cleaning agents, paints and personal care products. Newer, more energy-efficient homes do not breathe like older homes. Things like weather stripping and storm doors keep indoor air in and outdoor air out. This provides energy savings, but the limited exchange of outdoor and indoor air can mean a buildup of contaminants inside your home. What are health benefits of clean air? The medical community is recognizing the paramount importance of clean indoor air to a healthy home and focusing on the benefits of whole-home air cleaning as part of an integrated approach to respiratory wellness and allergy-related issues. Allergies and asthma are two health problems that can be helped with clean indoor air. When airborne irritants are removed, allergy and asthma sufferers often find relief from their symptoms. Even healthy people who have never suffered from allergies can benefit from clean air. Dust, smoke and other particles float around in the air, causing your drapes and furniture to gather dust. Whole-home air cleaners permanently trap the airborne contaminants that can aggravate allergy and asthma symptoms. By removing airborne dust particles, you reduce the amount of exposure your respiratory system has to them. 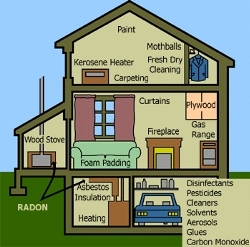 The first step to improving your indoor air quality is to identify the sources of air pollutants. Eliminating these sources to the extent feasible is the most effective way to clean the air. Chemicals in carpets, household cleaners, furniture and building materials, just to mention a few, all contribute to poor indoor air quality. Damp basements and other areas where standing water is prevalent can become the breeding grounds for pollutants such as mold, mildew and other microbes. Although it is not possible to eliminate every contaminant source, reducing the sources and/or the amount of pollutants they emit will contribute to a healthier living environment. While not every pollution source can be eliminated completely, ventilation plays an important role in improving indoor air quality. However, in an effort to increase energy efficiency, today’s homes are being built tighter, making it increasingly difficult to have the proper amount of exchange between indoor and outdoor air. Improper ventilation can lead to an increase in the concentration of pollutants inside your home. To increase ventilation, open doors and windows, particularly when you are using cleaning agents. Also, make sure to operate any exhaust fans your home may have. Boswell Plumbing & Heating can also assist you in recommending ways you can increase the ventilation in your home. We may suggest the installation of an outdoor air connection or the use of a heat recovery ventilator (HRV) or energy recovery ventilator (ERV). HRVs and ERVs work similarly, bringing fresh air into your home and exhausting stale air out. They conserve energy from indoor conditioned air and transfer it to incoming outside air. A third way you can minimize the concentration of pollutants in your indoor air is by thoroughly cleaning your living spaces. Frequent dusting and vacuuming can help reduce the amount of dust particles in the air. Washing bedding in hot water is the only way to kill dust mites. Not only will your indoor air quality improve, but your furnishings will benefit as well. They will stay cleaner, look better and hopefully last longer. Although these methods are effective, not all airborne particles can be removed. Some particles are so small, they may escape through the vacuum or never land on a surface. To capture these particles, products such as electronic air cleaners (EACs) and high-efficiency air filters can be beneficial. EACs and high-efficiency filters help clean the air and provide respiratory relief by removing dust, dirt and pollen.